News that Sinclair was building a streaming network first leaked last summer. Sinclair CEO Chris Ripley revealed a few more details at the NAB Show New York in October. Now, the service is ready for its debut. Sinclair will be leaning into its core business as a local broadcast TV company with STIRR, developing a streaming service that combines local content and general entertainment content, spread across individual “networks” within the app. "Our No. 1 one priority at Sinclair is to help advance the industry and increase access to broadcast content in the midst of a digital age," says Sinclair CEO Chris Ripley in a statement to Digital News Daily. 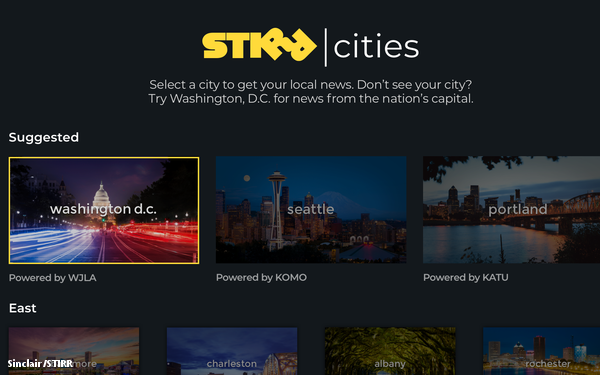 The biggest differentiator compared to competitive free streaming services is that STIRR will include a local network called “STIRR City,” based on where the viewer is watching. Sinclair will pull live local news and sports content from that region to feed into the channel, as well as entertainment and lifestyle content. For example, a user in Washington D.C. (or who wants to get local news from the Washington-area) will get content from Sinclair-owned WJLA. “Despite the explosive growth of new national over-the-top (OTT) services, local TV station’s programming, especially local news, has remained some of the most popular and desired content to audiences and advertisers alike,” says Adam Ware, STIRR’s GM. “By creating the STIRR CITY channel format, local TV stations can now extend their programming strength to OTT." National news and business news programming will be available via Cheddar, which will be getting its own network within STIRR. Other channels will include entertainment programming from Fail Army, Dove Channel and Pet Collective, sports programming from World Poker Tour, Sinclair-owned Tennis Channel, and Stadium. STIRR will launch with 20 of these networks within its app, and Sinclair says it expects to have more than 50 by the end of this year. STIRR will be based out of Sinclair’s Santa Monica, California office. The company says in addition to Ware serving as GM, Stacie Anthony will be its editor-in-chief, with Ben Lister director of content acquisition. At launch, it will be available through the Android and Apple app store and on Roku devices.